There are several different types of safety valves in use but all are designed to open completely (POP) at a specific pressure and to remain open until a specified pressure drop (BLOWDOWN) has occurred. Safety valves must close tightly. without chattering, and must remain tightly closed after seating. To understand the difference between boiler safety valves and ordinary relief valves is important, The amount ofpressure required to lift a reliefvalve increases as the valve lifts, because the resistance of the spring increases in proportion to the amount of compression. 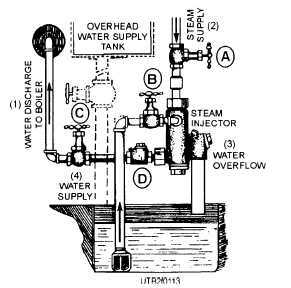 When a relief valve is installed on a steam drum, it opens slightly when the specified pressure was exceeded; a small amount of steam is discharged; and then the valve closes again. Thus a relief valve on a steam drum is constantly opening and closing; this repeated action pounds the seat and disk and causes early failure of the valve. Safety valves are designed to open completely at a specified pressure to overcome this difficulty. Several different types of safety valves are used on boilers; however, they all lift on the same general principle. In each case, the initial lift of the valve disk, or feather, is caused by static pressure of the steam acting upon the disk. or feather. As soon as the valve begins to open, however, a projecting lip, or ring, of the larger area is exposed for the steam pressure to act upon. The resulting increase in force overcomes the resistance of the spring. and the valve pops; that is, it opens quickly and completely. Because of the larger area now presented, the valve reseats at a lower pressure than that which caused it to lift originally. Lifting levers are provided to lift the valve from its seat (when boiler pressure is at least 75 percent of that at which the valve is set to pop) to check the action and to blow away any dirt from the seat. When the lifting lever is used, raise the valve disk sufficiently to ensure that all foreign matter is blown from around the seat to prevent leakage after being closed. The various types of safety valves differ chiefly as to the method of applying compression to the spring, the method of transmitting spring pressure to the feather, or disk, the shape of the feather. or disk, and the method of blowdown adjustment. Detailed information on the operation and maintenance of safety valves can be found in the instruction books furnished by the manufacturers of this equipment. Figure 1-12. 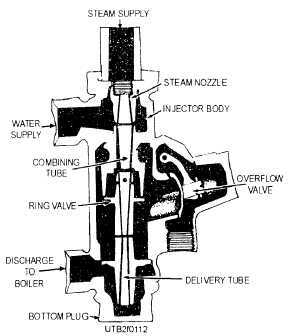 - A cross-sectional view of a steam injector. the boiler. This injection of water is many times the weight of the original jet of steam. The injector is used to some extent in boiler plants as an emergency or standby feed unit. It does not feed very hot water. Under the best conditions, it can lift a stream of water (that has a temperature of 120F) about 14 feet. Figure 1-13. - Injector piping.